Artist bids to save gallery, which paved the way for success. It was only three years ago that Southampton born artist Sarah Misselbrook graduated with a first class honours degree in fine art. Already the London art world is sitting up and taking notice of her fascinating artistry with body casts. 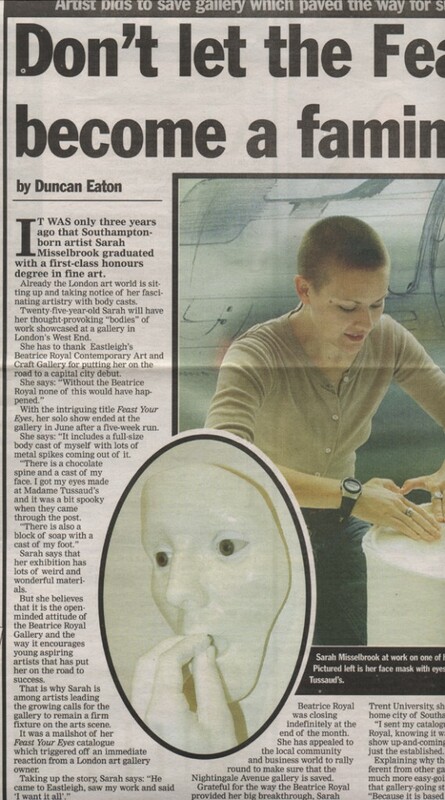 Twenty-five year old Sarah will have her thought-provoking bodies of work showcased at a gallery in London’s West End. She has to thank Eastleigh’s Beatrice Royal Contemporary Art and Craft Gallery for putting her on the road to a capital city debut. She says: ‘Without the Beatrice Royal none of this would have happened.’ With the intriguing title Feast Your Eyes, her solo show ended at the gallery in June after a five week run. She says: ‘it includes a full size body cast if myself with lots of metal spikes coming out of it. There is a chocolate spine and a cast of my face. I got my eyes made at Madame Tussuad’s and it was a bit spooky when they came through the post. There is also a block of soap with a cast of my foot.’ Sarah says that her exhibition has lots of weird and wonderful materials. But she believes that it is the open minded attitude of the Beatrice Royal Gallery and the way it encourages young aspiring artists that has put her on the road to success. That is why Sarah is among artists leading the growing calls for the gallery to remain a firm fixture on the arts scene. It was a mail-shot of her Feast Your Eyes catalogue that triggered off an immediate reaction from a London art gallery owner. Taking up the story, Sarah says: ‘He came to Eastleigh, saw my work and said ‘I want it all’.’ The exhibition will go to London’s West End in October. Sarah was shocked when she read the Daily Echo front page story that the Beatrice Royal was closing indefinitely at the end of the month. She has appealed to the local community and business world to rally round to make sure that the Nightingale Avenue gallery is saved. After graduating from Nottingham Trent University, she came back to her home city of Southampton. She says that involving the business world in the arts has played a major factor in the gallery’s success.